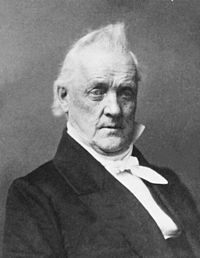 James Buchanan (/bjuːˈkænən/; April 23, 1791 – June 1, 1868) was the 15th president of the United States (1857–1861), serving immediately prior to the American Civil War. 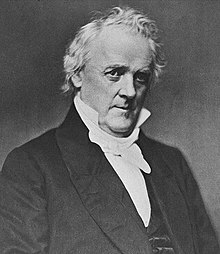 A member of the Democratic Party, he was the 17th United States Secretary of State and had served in the Senate and House of Representatives before becoming president. Buchanan was born in Cove Gap, Pennsylvania, to parents of Ulster Scots descent. He became a prominent lawyer in Lancaster, Pennsylvania, and won election to the Pennsylvania House of Representatives as a Federalist. 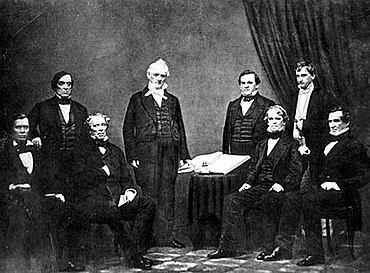 In 1820, Buchanan won election to the United States House of Representatives, eventually becoming aligned with Andrew Jackson's Democratic Party. After serving as Jackson's Minister to Russia, Buchanan won election as a senator from Pennsylvania. In 1845, he accepted appointment as President James K. Polk's Secretary of State. A major contender for his party's presidential nomination throughout the 1840s and 1850s, Buchanan finally won his party's nomination in 1856, defeating incumbent President Pierce and Senator Stephen A. Douglas at the 1856 Democratic National Convention. 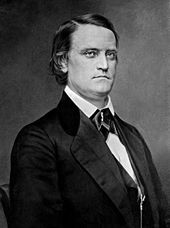 Buchanan and his running mate, John C. Breckinridge of Kentucky, defeated Republican John C. Frémont and Know-Nothing Millard Fillmore to win the 1856 election. Shortly after his election, Buchanan lobbied the Supreme Court to issue a broad ruling in Dred Scott v. Sandford, which he fully endorsed as president. He allied with the South in attempting to gain the admission of Kansas to the Union as a slave state under the Lecompton Constitution. In the process, he alienated both Republican abolitionists and Northern Democrats, most of whom supported the principle of popular sovereignty in determining a new state's slaveholding status. He was often called a "doughface", a Northerner with Southern sympathies, and he fought with Douglas, the leader of the popular sovereignty faction, for control of the Democratic Party. In the midst of the growing sectional crisis, the Panic of 1857 struck the nation. Buchanan indicated in his 1857 inaugural address that he would not seek a second term, and he kept his word and did not run for re-election in the 1860 presidential election. Buchanan supported the North during the Civil War and publicly defended himself against charges that he was responsible for the war. He died in 1868 at age 77, and was also the last president to be born in the eighteenth century. He is the only president to remain a lifelong bachelor. Buchanan wished and aspired to be a president who would rank in history with George Washington, by using his tendencies toward neutrality and impartiality. Historians fault him, however, for his failure to address the issue of slavery and the secession of the southern states, bringing the nation to the brink of civil war. His inability to address the sharply divided pro-slavery and anti-slavery partisans with a unifying principle on the brink of the Civil War has led to his consistent ranking by historians as one of the worst presidents in American history. Historians who participated in a 2006 survey voted his failure to deal with secession as the worst presidential mistake ever made. Buchanan began his political career in the Pennsylvania House of Representatives (1814–1816) as a member of the Federalist Party. The legislature met for only three months a year, and Buchanan's notoriety as a legislator helped him earn clients for his legal practice. 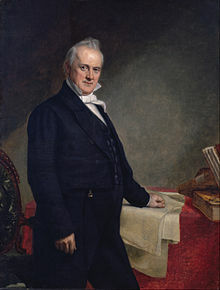 Like his father, Buchanan believed in federally-funded internal improvements, a high tariff, and a national bank. He emerged as a strong critic of the leadership of Democratic-Republican President James Madison during the War of 1812. When the British invaded neighboring Maryland in 1814, he served in the defense of Baltimore after enlisting as a private in Henry Shippen's Company, 1st Brigade, 4th Division, Pennsylvania Militia, a unit of yagers or light dragoons. Buchanan is the only president with military experience who did not, at some point, serve as an officer. This page was last edited on 22 April 2019, at 11:40 (UTC).